by Ackley, Betty J., R.N. ; Ladwig, Gail B., R.N. ; Makic, Mary Beth Flynn, Ph.D., R.N. 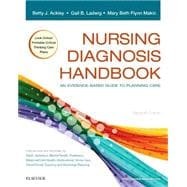 Nursing Diagnosis Handbook: An Evidence-Based Guide to Planning Care: 5 out of 5 stars based on 1 user reviews.